Despite positive reviews by critics, the Star Wars fanbase has been left fractured by the release of The Last Jedi. While some fans hail the film as the best installment since The Empire Strikes Back, other fans liken its release to the Star Wars Holiday Special. Whatever fans may think of the film personally, there is one thing that almost everyone should be able to agree on: it’s a terrible sequel. I understand that the TLJ apologists are probably shaking their heads right now, but hear me out. When it comes to some of the great sequels in history, The Empire Strikes Back being one, The Last Jedi just doesn’t hold its own. A good sequel takes the characters that are initially introduced and furthers their development. Considering where The Force Awakens left off, it meant Rey learning more about herself in relation to the Force. It meant Finn finding out what freedom is like outside of the oppressive shackles of the First Order. It meant Kylo Ren delving further into the darkness after his light was snuffed out, both literally and metaphorically, during his murder of Han Solo. And we see all of these things, to some extent, but nothing builds on anything that was set up in the previous installment, and by the time The Last Jedi ends, our characters are relatively unchanged from who they were at the end of The Force Awakens. Rey and Finn show that they will once again do anything to protect one another, and Kylo Ren is…still evil. In fact, the movie wastes so much time in trying to make Kylo Ren seem more relateable and sympathetic that he doesn’t truly do much the entire film. In The Force Awakens, we see him talk to the decaying helmet of Darth Vader as he begs for strength to lose himself to the dark side completely. Aside from the helmet-smashing tantrum at the beginning of the film when Snoke intimates that the infamous act actually weakened him, we see no inner turmoil. He seems perfectly composed when he is trying to manipulate Rey to the dark side in an attempt to use her power, and regresses back to the tantrum-throwing child on Crait when he sees both Rey and Luke doing everything in their power to save the Resistance. Speaking of Rey, we still have very few answers as to who she is or where she comes from. While some argue that her parentage shouldn’t be important, it’s important to Rey, and potentially to the story as a whole. Kylo baits her into confessing that her parents were “nobody” but the reveal is far from satisfying, especially considering that Rey never believed herself to be part of the fabled Skywalker lineage. Even if her parents were just ordinary civilians, it should have some impact on Rey. But we never see it. The closest thing we see is her desire to reunite with Finn and the rest of the Resistance, perhaps in an attempt to start a family of her own among their ranks. But this stands in strong antithesis to what Rey says to Luke earlier in the film. After she touches Kylo Ren, she’s convinced that he will return to the light side and he will be the one that will help the Resistance win the war. When she goes out to him, she’s not hoping to redeem him. She’s trying to convince him to rejoin the fight so that she won’t have to. It’s the same reason why she reached out to Luke. He’s supposed to be the legendary hero: she just wants to be Rey. The film also stagnates on Finn’s character. While he broke away from the First Order in an attempt to find his own freedom, he finds himself once again seemingly shackled to another organization, this time to the Resistance. He sets out to help them because he knows that Rey will be walking into a death trap when and if she returns. Just as it was in The Force Awakens, Finn’s primary motive is helping Rey as best he can, and his character doesn’t evolve much past this point. His role was reduced to what many have called a comedic side plot, which is a distressing place to be for the saga’s dual-protagonist, alongside Rey. And this is where the film ultimately falls flat in where it stands in relation to the overall series. 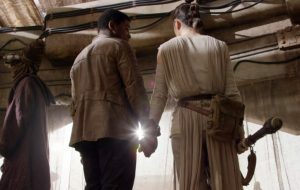 Much of The Force Awakens focuses on the budding relationship – friendship or otherwise – between Rey and Finn. Aside from small comments here and there to show that they are thinking about each other, they don’t reunite until the end of the film, and even then, no lines are spoken between them. If the film had taken the time to watch them both grow independently before they’re united again, that could possibly strengthen the film in its relation to the saga as a whole, but that’s not what this film does. The film keeps them apart, and they are very much the same people that fought together on the Starkiller Base, albeit a bit more traumatized by their experiences. Even the rest of the characters don’t show any significant growth from one chapter to the next. Poe struggles with and resolves his trouble following authority, which has never been shown to be an issue in either the previous film or the comic series. Leia fails to mourn Han, and even Chewie barely takes a moment before chowing down on his BBQ Porg to miss him. Considering Han’s overwhelming impact on the original trilogy, how quickly the characters seem to move on from his death is distressing, at the very least. Even Captain Phasma and Supreme Leader Snoke seem like cheap villain-of-the-week cartoon big bads in relation to Darth Vader and Emperor Palpatine, who loomed as an ever-constant threat over our heroes during the original trilogy. But if there’s another moment when the movie makes the saga fall flat, it’s in regards to Luke Skywalker. His character does a complete one-eighty from how he’s originally presented in the original trilogy. This Luke Skywalker is bitter and frustrated. He laments how people treat him as a hero when all he sees himself as is a failure who couldn’t even save his own nephew. While the film supposedly carries a message advising against hero-worship, Luke sacrifices himself at the end of the film so that the Resistance can safely escape Crait, and the last scene shows the children cheerily playing with a Luke figure, distorting that message entirely. The message was not an easy one for audience’s to swallow. 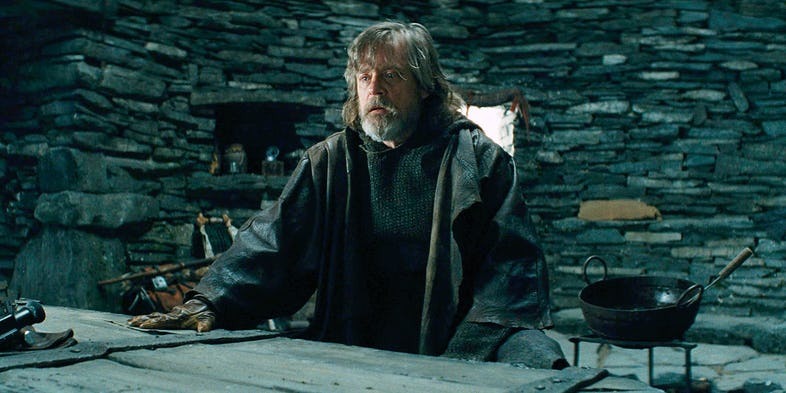 For many, Luke Skywalker had become a symbol of hope and optimism, and to see him so worn down and bitter was a shock to many. Removing Luke’s status as a hero wouldn’t have been so much a problem if it had been done in the right way. The film suggests that Luke tried to kill his nephew and takes time to try to paint the villain as misunderstood and sympathetic, but neglects to actually follow through with the character progression, robbing both Kylo Ren and Luke of what might have been an interesting twist. Instead, there was a much easier way to strip away Luke’s hero status without sacrificing the integrity of the character that had been built up over the course of three films. While Luke Skywalker’s name had become synonymous with defeating the Empire singlehandedly with nothing but his lightsaber and the power of the Force, Luke could have told Rey the story of what really transpired. He could tell her the story of how his impatience got the better of him, like when he interrupted Yoda’s training of Dagobah in an attempt to save his friends. He could tell her the story of when his friends came to his aid, like when Han came out to save him on Hoth. In the end, Luke’s success never came from the Force or his lightsaber skills. It was love and human compassion that ultimately persuaded the former Anakin Skywalker to turn against his Master to protect his son. That lesson, of love and connection and choice, is one that is both true to Luke Skywalker’s story and one that an uncertain Rey could have used. Luke could have stripped away his hero status revealing that there was nothing remarkable about him or his abilities; in the end, it was his humanity that helped him conquer the dark side. Instead, the film opted to turn Rey against Luke, painting their relationship as strained and unfortunately antagonistic for much of their scenes together. I have the feeling that some of you might be saying that I’m missing the point. That the ultimate goal of the film was to subvert expectations: Rey isn’t a Skywalker. Your heroes aren’t who you might expect them to be. Villains can have sympathetic origin stories. The problem with the film lies in just that: you can’t have a good sequel if you ignore the work that came before it. In order for a trilogy to progress, it needs a good middle. This is true of any story. The middle of the story is the heart of the story. It lets our characters progress and grow. It tests their relationships with each other, whether it strengthens them or tears them apart. While it could arguably be a symptom of a shortened timeline, the film does little to enhance the characters or show any signs of growth. Instead, it seems to backpedal on the characterizations already set in place. The most obvious example: given that Rey just watched Kylo Ren kill Han Solo, try to kill Finn, and almost kill her, why would she, even with Snoke’s visions, give him a second chance? The nihilistic theme of subverting expectations might work in a standalone movie, but it doesn’t work in the middle part of a saga. And while some say that the film’s dark tones were more realistic, it’s important to remember that Star Wars is a children’s film at heart. Star Wars, at its core, has always been focused on the struggle between good versus evil, about the duality of choice, and that love, friendship, and compassion will ultimately conquer the dark side. It’s a positive and inspiring message. Although the last scene of the film seeks to find some solace in the future as the slave boy on Canto Bight uses the Force, the scene that stays with many is of our ragtag band of heroes sitting despondently in the battle-weary Millennium Falcon, licking their wounds as the threat of the First Order looms overhead. The odds don’t just seem stacked against them; they seem insurmountable. It reinforces the message that they experienced back on Crait: you’re alone in the galaxy and no one is coming to help you. Not all films are going to have happy endings, nor should they. There would be little reason to have part three of a trilogy if the second film ended on a happy note. The problem with the second film is that it focuses on the darkness and flaws of all of its characters. It opts for edgy and anomalous, without acknowledging the tone that it’s predecessor set before it. One good example of a trilogy done right is The Lord of the Rings. The Two Towers picked up where The Fellowship of the Ring left off. It continues its themes of choice, of human compassion against a spreading darkness, and finding solace and support in your allies while still carrying a tone that is both optimistic and hopeful. The movie serves to show that, even when it seems that all hope is loss, there is a fundamental goodness in humanity that people can rely on. This theme carries over into many other franchises, and Star Wars is no exception. This theme, while present in the first film (Finn helping Poe escape, Rey and Finn helping each other escape Jakku, etc. ), is notably absent in the second film (Luke dismisses Rey, Poe picks a fight with his new leader, everyone gets abandoned on Crait, etc.) While there are a few bright spots throughout the film, the overall cynical message of the film left many leaving the theater feeling uncomfortable. One of the first words used to describe The Last Jedi was “different.” Different doesn’t necessarily mean good or bad, it just means that it deviates from the track that its predecessor had set it on. And that’s the problem with The Last Jedi. The primary job of the middle film in a trilogy is to watch the characters grow and evolve. They didn’t here. Another job of the film is to carry over the message of the first film, so that it can have a satisfying resolution in the next installment. It doesn’t happen here. The film wastes so much time trying to be different and stand out from its predecessors that it failed to achieve the basic cohesion that this trilogy desperately needed. Much of that “spark” has inevitably died out. Some people blame it on Star Wars fatigue, and with the recent flop of Solo in the box office, many would be inclined to agree. But many fans were left hurt by The Last Jedi, and while many criticisms have been brushed off as, “Well, you’re just upset you didn’t get what you wanted” there’s nothing wrong with being critical of a film that failed to deliver on its most fundamental role: to continue the story. People expected to see their favorite characters grow and evolve. They expected themes set up in the first film to be explored. They expected the overall tone of the story to continue so when they marathon the entire trilogy, as many are inevitably waiting to do, they can have a satisfying story: beginning, middle, and end. There’s nothing wrong with telling a story that will be the antithesis of audience expectations. Some people might enjoy it as its own film, and some people did enjoy The Last Jedi. But this subversion also runs the risk of sacrificing the fluidity and cohesion of the story as a whole, and that’s exactly what The Last Jedi did here. Whatever you may think of it as a film, you have to acknowledge that many of the criticisms concerning its status in the trilogy are valid. The film fails to deliver on the basic facets that make a good sequel…well, good. And isn’t that all people really wanted to begin with? This essay could, in actuality, serve as the eulogy–the footnote–to the entire Star Wars journey [rollercoaster] !